PEEK Mil-C-26482 type 19 pin connectors. The female connector mates directly onto the vacuum side of the MIL-C-24682 feedthroughs. It is locked into place with a single captured retaining screw. Order contact pins or sockets seperately. 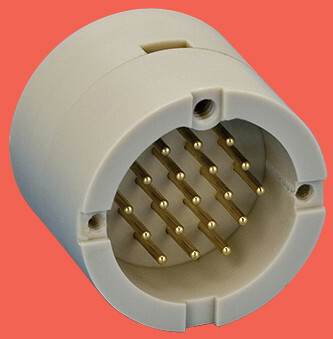 PLEASE NOTE : Pins and sockets are sold in packs of 10 pieces, therefore 2 packs required to fully populate a 19 pin connector.